Amorphous solid dispersions have enabled the successful formulation and advancement of many low aqueous solubility compounds by providing enhanced oral bioavailability from the modified drug form. While there are several platform technologies and manufacturing techniques to produce amorphous solid dispersions, hot-melt extrusion (HME) is a leading approach based on mature process understanding, small process footprint, continuous operation and readily scalable. These attributes allow for more of a plug-and-play unit operation, resulting in relatively lower manufacturing costs and making it a more appealing commercial process train. Hot-melt extrusion is a technique for manufacturing amorphous solid dispersions in which the drug substance is melted or dissolved within a dispersion carrier and mixed to produce and stabilize the amorphous form of the drug substance. Functional excipients, such as surfactants, are often added to further aid in processability or improve the dissolution performance of the formulation upon administration. The melt is extruded through a shape-forming orifice and, upon rapid cooling, remains a solid, single-phase, glassy amorphous matrix that is shelf-stable. 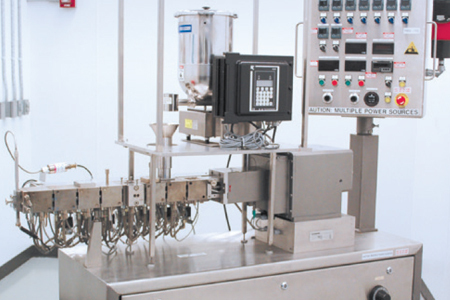 Post-extrusion processing equipment can be adapted to manage the extruded shape, making it amendable to downstream processing into a dosage form. In general, these materials are milled to reduce the particle size to be incorporated into a traditional oral solid dosage form such as a tablet or capsule, while maintaining the desired release profile for the drug.